You drink beer for the first time. Still young, you do not like it. But as time passes you get used to it, becoming a regular drinker without even realising it. Then one day you discover that there is a greater variety of beer than what you thought, and begin to try different brands; some of which you get you excited. In those moments, you feel that beer is a defining feature of your person. But suddenly you visit a site, sample a beer or talk to a person. And one, or more, of these factors lead you to a sudden turning point in your path as a beer aficionado. Suddenly you realise that you actually do not know anything about your favorite drink, discovering its unattainable gastronomic and social magnitude. "Fortunate enough, my first beer book was this great reference"
It is in then that you decide to persist; to investigate further. You go online and discover different beer-realted websites; there is even people who write a blog: tasting notes, personal experiences, reflections and debates. You begin to follow some of these sites and, at some point, you decide you definitely want to know more. Here there are several options, but some of us decided it was time to buy a book. And personally, I was lucky that one of the first two books I ordered from the UK was Randy Mosher’s 'Tasting Beer' Randy Mosher - recently translated into Spanish by Ediciones Omega under the title 'Cómo catar cerveza'-. Background... what would a book on beer be without a history section? Still, the content is well curated and its length has been properly adjusted to its purpose. Sensory evaluation... understanding the relevant elements in beer, the brewing process and guidelines to taste it: from the description of aromas and flavours to formal judging. Presentation... briefly, how to serve and match beer with other elements. Tradition and styles... deepening in the understanding of the origin and expression of the commonly recognised beer categorisations. With this clear, well-organised structure described above, Randy reaches his goal with ease, even when his conception of the significance of tasting beer can be a bit excessive -art?!-. Being a masterfully balanced work in terms of content: each different section is neither too short nor too extended. Being very pleasant to read: its size, weight and paperback facilitate its handling. The font size is also comfortable for the eyes. The feel of the cover and the thickness of the pages are ideal, and its general smell is very neutral. Its attractiveness, thanks to a good combination of colours, pictures and infographics to accompany the content thread, with a flawless quality layout. The quality of the paper and printing is also remarkable. Its accuracy, as it does not contain typographical errors or -without my having made an exhaustive analysis- historical discrepancies. It gives me certain confidence that I have consulted it three or four times to see how it skillfully manages some parts in which legends abound with enough vagueness. Transcendent, compacting in just over two hundred pages a base of useful information to understand beer as a product, becoming a successful reference work for many beer aficionados around the world. It is difficult to find faults in this book, beyond the necessary generalisation of certain concepts or the abovementioned vagueness, which may make it complicit with some myths that should be banished. As noted in the introduction, anyone looking for a book to enter the exciting world of beer, acquiring a general but comprehensive view of its magnitude. In addition, those enthusiast seeking a general reference manual to have on hand: maybe not to read it from beginning to end, but to check and look up useful information. The general approach of the book, accompanied by a high degree of completeness, make it a very ‘drinkable’ and cross-wise work to acquire knowledge on beer. It does not go to the depths of it; it is not its purpose: conversely, it serves as a solid base upon which one can rely to start exploring more specialised topics. Publication → 2009 -1st edition- by Storey Publishing (USA). 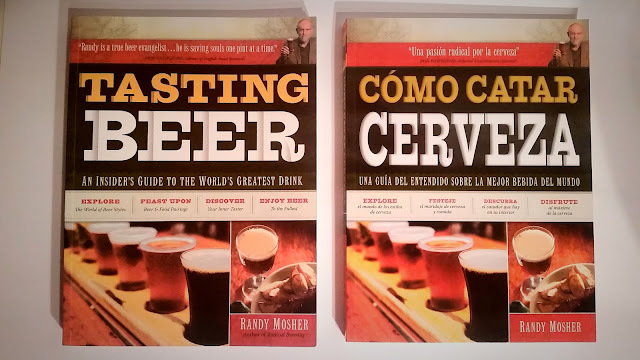 Translation → Cómo catar cerveza (2015, Ediciones Omega). Size → 17,9 x 23,6 x 2,1 cm. It can easily be found in a wide number of online book sellers. The Spanish translation is distributed by Más Malta. Transparency disclaimer: the book 'Cómo catar cerveza was provided to me for free by Más Malta.